The Japanese video game music legend oversees the recording of the ultimate Final Fantasy album with the London Symphony Orchestra at the legendary Abbey Road Studios. Group photo! Nobuo Uematsu and co outside the legendary studio. The score itself in pride of place on the Abbey Road console. Uematsu-san enjoys a cuppa in the control room. The orchestra make headway on the recording. 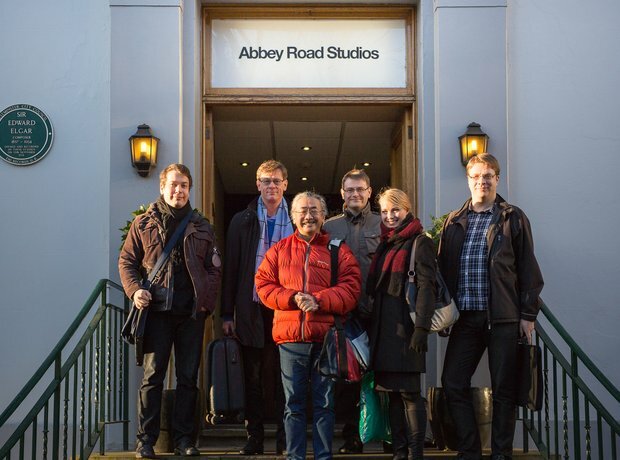 Video game concert impresario Thomas Böcker and Final Fantasy composer Nobuo Uematsu at Abbey Road studios. Uematsu and conductor Eckehard Stier plot their next move. The sound of Final Fantasy comes to life at Abbey Road. Taking a break to visit the famous Abbey Road crossing. Uematsu signs the wall, alongside the signatures of fellow musical legends. Uematsu listens in to make sure his musical vision is executed perfectly. The whole Final Fantasy album gang. Nobuo Uematsu takes a break from recording sessions to do an interview. A sneak peak at some cover art, maybe? The LSO in flying form at Abbey Road.